It’s the fabulously fun Beth Massie, who can also keep you up all night with her stories! The wild and wacky horror biz! I’m not much for crowds or big, noisy parties. I prefer small groups of friends, hikes, camping, hanging out. I’m very spiritual but with no identifiable religion. I am passionate about human rights. It takes a lot to rattle me – I’m not going to be the one behind you honking the horn or the one in line bitching about the wait. Rural, western Virginia – I love it here. My family has lived in this area since 1746. 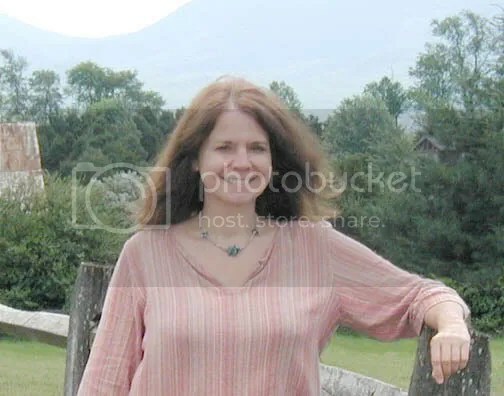 My author’s website is www.elizabethmassie.com; I’m also on Facebook. I hate most horror movies. As someone who writes a great deal in the horror genre, you’d think I’d love most of them but I don’t. Too many are crass, crude, flat, and empty. Those who read my horror fiction but haven’t met me seem to think I’m supposed to be some sort of edgy, spooky, depressed chick. Nothing could be farther from the truth. While a realist, I’m also an optimist who believes things can change. One reason I write in the horror genre is to explore the human condition. I am highly sensitive to the suffering of others. For this reason, I’m actively involved with Amnesty International and have been for twenty-four years. Not sure, really. I just keep plodding along. I want to keep writing, and I want to create fiction that troubles, inspires, and moves people. I keep it simple. Go out to Starbucks for a chai or to dinner with Cortney. Listen to peaceful music, pray, read. My significant other, Cortney Skinner, makes me laugh every day. He is the funniest guy around. So does my sister, Barbara Spilman Lawson, a professional storyteller and favorite local actress. I also love well-done political humor and the show 30 Rock. God, Cort, people, nature, the music of Jim Brickman, David Lanz, Secret Garden. A day at the beach. A night in the mountains. Kindness, compassion, and intelligence. And men in Revolutionary War/Colonial period clothing. OMG don’t get me started! Well, on my newest books, of course! At the moment that would be my ghost novel Homeplace and the upcoming The Tudors: Thy Kingdom Come and Images of America: Waynesboro. And then there is my Skeeryvilletown line of cool stuff at Café Press. And on the more humanitarian side, I really wish people would be more willing to share what they have with those who would truly benefit. Donate to Amnesty International, Habitat for Humanity, Women for Women, Human Rights Campaign, or other wonderful organizations. If everyone donated a little, if every stepped forward with a bit of active compassion, can you imagine what could be accomplished? My mom, a watercolorist. Jane Addams. My sister, Barb. Eleanor Roosevelt. My daughter, Erin. I would buy a nice Victorian house here in the Shenandoah Valley with a bit of land – room enough for Cort to have a third floor studio and to put all his strange collectible stuff (much of which is currently in storage). I’d put some aside for later. And I’d donate a large check to Amnesty International, Women for Women, and Habitat for Humanity. I’d also give money anonymously to those who seem in need. Thank you so much for being part of this celebration: you are indeed wonderful! Ia Maassie still on Horror? I gather she lurks only, if so. No, I don’t think so. Maybe I can persuade her to join. It’s the Horror in Film and Literature discussion list which has been around since the late 80s, I believe. I joined in ’94.Our blog is somewhat out of date, but you can get information on the list, see the archives and (if you’re interested!) join. It’s generally fairly low traffic with mostly thoughtful discussions and an appreciation for all sorts of horror. Check it out! Im my bleary way, I misread “horror biz” as “Horror list”. You need more sleep, Todd!